There is an implementation in C here in the forums, but I couldn not find anything ready-made for NodeMCU. Not all of the modules are really used in this script, of course. So you can trim that down a bit. 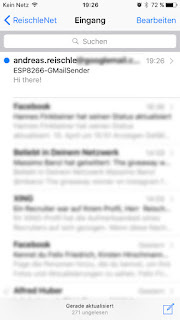 With all of that in place, it only took a few minutes to have the first mail sent from my ESP8266-DEV board. -- to man-in-the-middle attacks as the client doesn't check the server's certificate. ------- @description a basic SMTP email example. You must use an account which can provide unencrypted authenticated access. ------- This example was tested with an AOL and Time Warner email accounts. GMail does not offer unecrypted authenticated access. -- The SMTP server and port of your email provider. -- The do_next() function is used to send the SMTP commands to the SMTP server in the required sequence. -- I was going to use socket callbacks but the code would not run callbacks after the first 3. "From: \"".. MY_EMAIL .."\"<"..MY_EMAIL..">\r\n" ..
"To: \"".. mail_to .. "\"<".. mail_to..">\r\n"..
"Subject: ".. email_subject .. "\r\n\r\n" ..
-- The connectted() function is executed when the SMTP socket is connected to the SMTP server. -- in sequence, one by one, every 5000 seconds. -- You can change the time to be smaller if that works for you, I used 5000ms just because. This will need a little tidying, but will certainly make it into one of my projects. NodeMCU's SSL implementation does currently not check the server's certificate. So I suspect man-in-the-middle attacks are easy. As the message suggests, it might be a DNS issue. Use "173.194.200.108" in the SMTP_SERVER variable. That should eliminate the need for DNS. I haven't tried that, though. 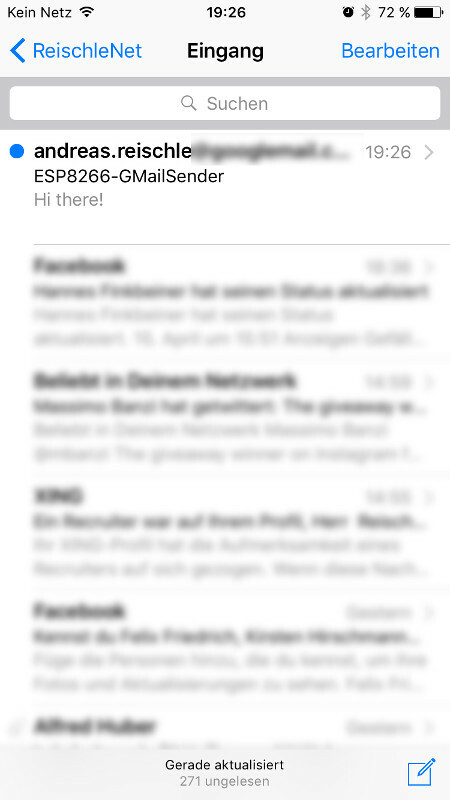 That sounds like the "function send_email(subject,body)" is started. But it never gets to the point where it starts transmitting anything and "function connected(sck)" is never called. That can only be when the TCP connection to "smtp.gmail.com" on port 465 fails. Try if you can telnet to that port from your PC. Also: replace smtp.gmail.com with the IP 173.194.200.108 to eliminate DNS issues. I used some of your code in one of my projects. You mention something about socket callbacks in the comments but just say that it didn't work past 3. I tried moving the do_next() to the display function, and it worked perfectly. It now takes 1 second to send my email rather than the 45 seconds or so that it took before. I'm not sure if this is what you tried and it didn't work on earlier firmwares or if you were doing something else. I would be interested to know. Thanks, that is great info. I'll try if I can replicate that. Did you check "Miscellaneous options/ SSL support" when requesting you custom build ? I am getting looping boot info about cksum after flashing. Success report ! I was able to use this code to successfully send email from both a esp8266-01 and from a -12e Devkit (in spite of warnings the -01 might not have enough memory) The key for me was adding,in addition to the new build at 0x0000), the esp_init_data_default.bin at 0x3fc000. Initially after a flash I was getting the esp8266 led flashing rapidly outputing error code on 74880 baud via the Lua Loader serial output. Then I did a flash with the new firmware at 0x0000 and esp_init_data_default.bin at 0x3fc000. same result. Then, after another flash with just the esp_init_data_default.bin at 0x3fc000 again, it worked. (For the custom build, I checked the SSL box in below the main selections). BTW, does anyone know how to load a library module that is referenced by "require()" ? But I never tried that myself. I've been working with this code for some days. Today, out of the blue, the SMTP server didn't accept the authentication anymore. After some try and error I had to figure out that it was the fact that I had installed a float firmware in the meantime. Changing back to the integer firmware, everything was fine again. Any ideas or suggestions? Unless the float version has no SSL-Support built in, I don't know. I hardly ever use float in my projects. I am facing problems with custom builds for my ESP12E 4MB WIFI board. In some cases, the board is just like dead, wheras in other cases, the blue LED keeps blinking fast and the ESP keeps sending rubbish data to the ESPLORER whatever the selected speed (I tried all speeds from 2400bds up to 115200bds). I am now quite lost with these custom builds but I really need to use them for I want to include modules like adc,crypto,file,gpio,http,i2c,net,node,tmr,u8g,uart,wifi as suggested in this blog ! What would you suggest me to try ? Following my previous post, I have finally solved my ESP8266 'custom build' problems (thanks to Marcel Stör here >>> http://stackoverflow.com/questions/38789491 ). Now that I have installed on my ESP12E the proper FW (with the right biolt-in modules), I'll be soon able to test your SMTP Lua script ! Very interesting. I was not aware of that and resorted to flashing AT-Firmware before re-flashing NodeMCU. But you pointed to a much cleaner solution. Thanks! I spent nights and days before I could understand that I had to flash again the esp_init_data_default.bin along with a custom-built FW !! Espressif changes the init data block (esp_init_data_default.bin) for their devices along the way with the SDK. So things break when a NodeMCU firmware with a certain SDK is flashed to a module which contains init data from a different SDK. It definitely works quite well !!!! The mods you made to have the script usable on Gmail SSL SMTP works 100%. I'll look over this, thanks alot. I'm trying to send Gmails but nothing happens. 72 "From: \"".. MY_EMAIL .."\"<"..MY_EMAIL..">\r\n" ..
73 "To: \"".. mail_to .. "\"<".. mail_to..">\r\n"..
74 "Subject: ".. email_subject .. "\r\n\r\n" ..
Hi Andreas, I was wondering if there are any new advances in sending emails from POP3 or gamil yet ? I was wondering if anyone has any idea how much heap it takes to run this? I was able to take Andreas' code and modify to get to work in my situation. It works (I get the email message) if I estart NodeMCU and run it almost by itself starting with about 42000 heap available. But if I keep updating heap rapidly as this runs heap can get as low as 18000. It makes it hard/impossible to run much else on the module. I'm guessing it has to do with all the data coming at the connection time, but just a guess. Is this what anyone else has seen? My code is admittedly pretty poorly written. I also had problems with it. I think it takes a complete re-write to get more efficient, ressource-saving code.